Exiled blogger Tumso Abdurakhmanov in a debate with Magomed Daudov, the speaker of Chechnya’s parliament. YouTube screenshot, captured by Runet Echo. The blogger rose to public prominence in 2015, when he supposedly failed to give way to the cavalcade of Islam Kadyrov, the cousin of Ramzan Kadyrov, Chechnya’s all-powerful ruler and himself holder of various official titles, including the mayor of Grozny, Chechnya’s capital. 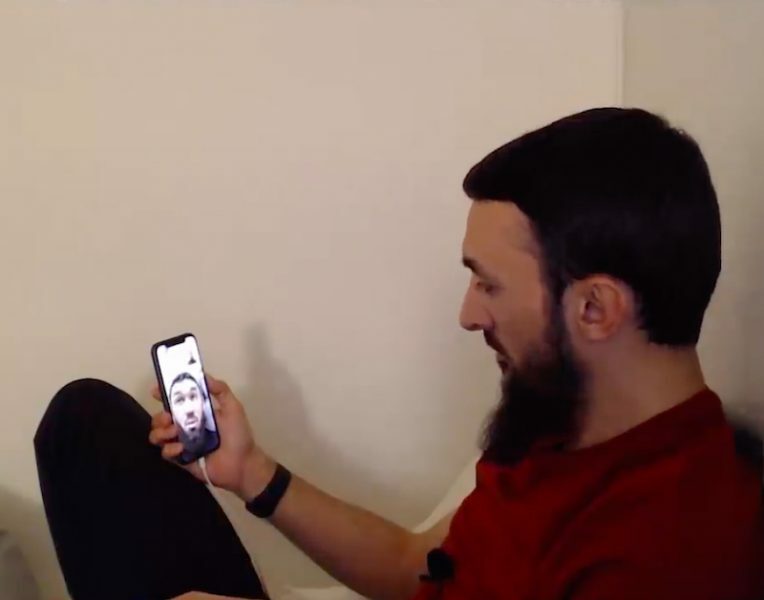 Abdurakhmanov claims Islam Kadyrov confiscated his phone by force and confronted him about the anti-Ramzan Kadyrov and anti-Putin caricatures, videos, and other content from his blog. Abdurakhmanov, as he described it to reporters, was taken to be questioned by Islam Kadyrov and senior Islamic clerics who accused him of being “hardened Wahhabi.” Following that episode, the blogger fled the country and eventually landed in Poland, where he is currently fighting extradition to Russia. He is sought after by Russian anti-terrorist authorities who accuse him of being a member of an “illegal armed group” fighting in Syria — a charge that Abdurakhmanov vocally denies. Abdurakhmanov did indeed immediately upload the three hours of tense exchanges in Chechen and occasional Russian, in several parts, to his YouTube channel. The first part attracted 2,5 million views at the time of writing — an astonishing number, given that only 1,2 million people live in the republic of Chechnya. Abdurakhmanov’s channel, which goes under the nickname Abu Saddam Shishani, has almost 50,000 subscribers. What Daudov said then (“blood feud”) is the matter of some linguistic debate, as media outlets focused on the North Caucasus say the term used by Daudov only applies to narrowly defined circumstances of blood revenge one family wages on another for the murder of one of its own. Since it’s not relevant in Daudov and Abdurakhmanov’s case, experts say the latter is unlikely to be targeted in a vendetta, although he still must be in considerable danger, given the brutal end of many of the regime’s public enemies.